La Chaux-de-Fonds, July 9, 2010  - Since the launch of The Double Tourbillon 30° in 2004, Greubel Forsey has released 3 lines based on this invention, namely : Contemporaine (which includes Vision and Secret models), Invention (which includes the Invention Piece 1 model) and Technique (the Double Tourbillon 30° Technique model). • 11 pieces in platinum. The closure of the Double Tourbillon 30° Contemporaine is a strong symbol for the brand: This line is heavily steeped in history as it is the timepiece which launched the Greubel Forsey adventure and forms the foundation of legitimacy for the inventions that followed. The decision to cease the Double Tourbillon 30° Contemporaine after six successful years will also see Greubel Forsey channelling new energy in creating systems, inventions and to explore new avenues. The complexity of this timepiece is not only limited to the tourbillon system, but is visible in other aspects including a new kind of dial. This exclusive gold dial integrates three sapphire crystal plates. These complex insertions are engraved and enhanced by a 3D structured text. The bezel with beveled relief gives an original look to this final edition, a new interpretation of the style of the earlier models while retaining the intrinsic design features of a Greubel Forsey timepiece. 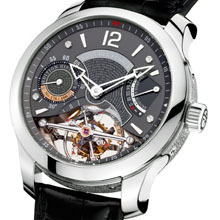 Like the other Greubel Forsey timepieces, the Double Tourbillon 30° expresses the thinking of its creators. Visually, you will also discover the 3D structured text on the dial and engraved hand-decorated curved plates affixed to the sides of the case extolling the philosophy and skill of the inventor watchmakers. Invented in the early nineteenth century for the pocket watch and virtually unchanged since, the tourbillon aims to eliminate the equilibrium difference of the balance spring caused by gravity. 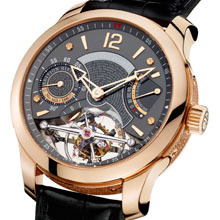 However, since the beginning of their adventure together, the inventor watchmakers Robert Greubel and Stephen Forsey have always sought to exceed the achievements of watchmaking science, going further in the complexity and research to effectively improve the operation of the wristwatch. They developed a tourbillon caged within a second cage, so that this new complication will permanently cancel the rate errors due to gravity, taking account of all the usual positions of a wristwatch. Called the Double Tourbillon 30°, precisely because of the angle that connects the two rotating cages, this patented system provides a decisive technological progress and marks a milestone in the history of watch-making.